I've been in a bit of a slump lately when it comes to reading, and even more so when it comes to reviewing. At times like these, I need an author to surprise me, to show me something I haven't seen before. Something I can be excited about. A lifeline to pull me out of the reading doldrums. 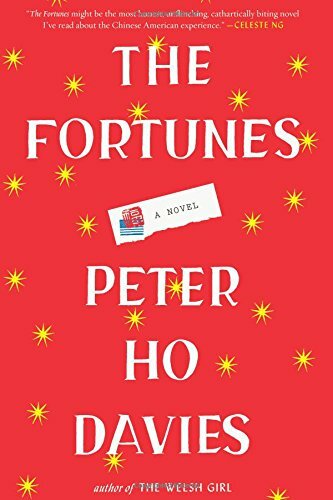 Enter Peter Ho Davies' new novel, The Fortunes, stage right. Here's what's so cool about it: the book reads more like a set of interconnected novellas than a straightforward novel. There are four discrete storylines, told in separate sections one after another. It's mainly the themes that overlap—immigration, identity, belonging—while the characters and their situations are all very different. Taken together, like a collage, they tell what it has been like to be Chinese-American at various times in history. My favorite part of the book was how powerfully Davies demonstrates the inherent conflict of being a part of two distinct cultures. His characters do not fit perfectly into either their Chinese or American worlds, seemingly no matter what they do. Thus each one has to define their own identity on their own terms, which was both interesting and gratifying to watch from my readerly perch. I also loved the historical aspect of the novel, as it made real to me some parts of history I was only vaguely aware of, like the construction of transcontinental railroads and the California gold rush. Here's to authors doing new things and the blessed approach of sweater weather. I'm hopeful the combination of the two will be enough to bust me out of my recent slump. With sincere regards to Houghton Mifflin Harcourt and NetGalley for the advance copy. On sale today, September 6!